So, you know… I’m developing an expensive interest in fragrance. I thought it wouldn’t happen… I still have to work very hard to look beyond the obvious when it comes to perfume but the spirit is willing and my past experience tells me that this is all I need to entangle myself in a new obsession. 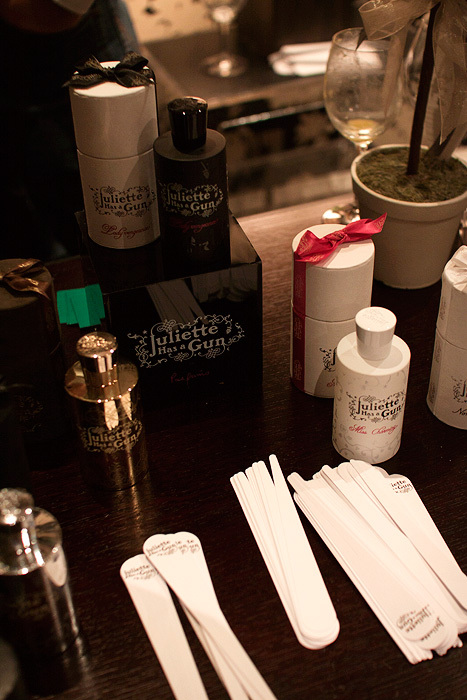 I went along to an Escentual.com press event some weeks ago and had the opportunity to smell my way around the room so to speak. From a personal point of view it was a real treat to be able to literally wallow in such an array of nice fragrances in a relaxed setting. It’s something so hard to do in a retail environment where you’re literally jumped on from the moment you show the slightest interest in the bottles on the shelves. I must have raised over 30 different scents to my nose that evening, let me introduce you to some of the niche brands available at Escentual.com. “Creative” only lightly scratches the surface of descriptive words one could use to describe this young, French fragrance house. 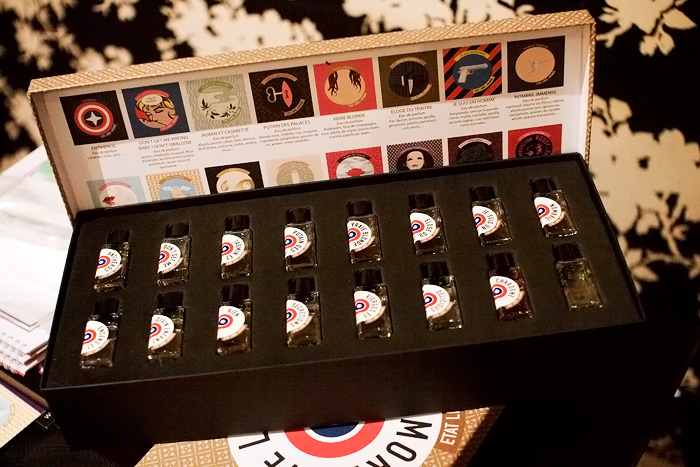 Novel would be another but don’t mistake Etat Libre D’Orange simply as a cheeky maverick because there’s as much about quality as there is controversy to this unusual fragrance collection. Secretions Magnifiques* is their most famous scent which basically conveys bodily secretions in their full and frankly, unpleasant aroma. Blood, sweat, sperm and saliva… what more could you want to douse yourself in post-morning shower? Let’s just say… it has a certain amount of metallic authenticity to it and I keep the lid of my sample very tightly closed. On the flip side, I adored Jasmin et Cigarette which is a floral like no other. Side order of ashtray anyone? But it works… it doesn’t pretend to be tobacco, just pure unadulterated ash tempered by the sweet floral notes of Jasmine. It’s a beautifully worked juxtaposition. Notorious makers of the Not A Perfume EDP that contains a single ingredient of dilluted Ambrox, this one didn’t set my world alight in the slightest. I found it as bland as quite frankly, it probably should be. On the other hand, I recently took a passing sniff at a bottle of Calamity J which has landed itself squarely on my wishlist. A boozy, smoky, woody amber without a hint of floral or fruit to feminise it. Heaven! 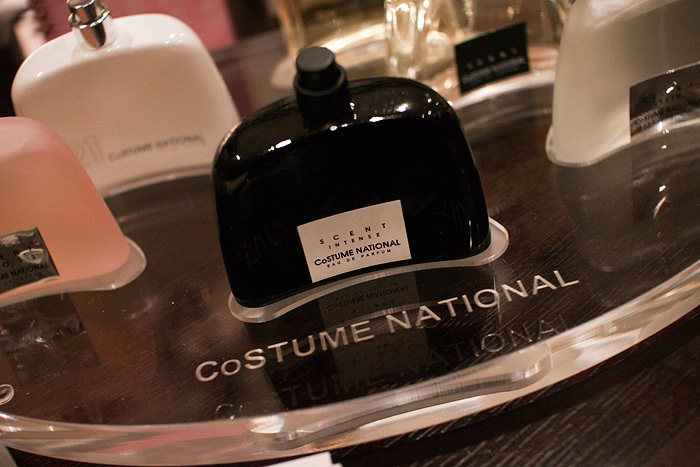 Finally comes a range from the Italian fashion house, Costume National. I could take or leave the feminine scents that to my nose held no interest… they’re mostly sweet, light affairs (with the exception of Scent Intense which allowed me to appreciate an amped up version!). However, I did fall in love with the gentleman’s fragrance from the range! Simply titled Homme, it’s a spicy scent with a base of musk and a heart of wood that is beautifully resinous without being syrupy. Some of those sound really interesting. I just got some samples from Black Phoenix Alchemy Lab, those ones are beautiful and unique. You should check them out if you haven’t! It’s on my todo list but last time I attempted to navigate, I found the BPAL website a bit confusing! You might be better off checking out the forums first (bpal.org), they’re handy to get your bearings. I know I was pretty overwhelmed when I got into BPAL last September.. but now I’ve tried over 500 (literally!) scents! I nearly threw up when I read about the secretions perfume. You know, the weird thing is… Mr. L actually quite likes it. I made him smell it without telling him what it was supposed to convey. I’m curious as to how much my dislike of it is influenced by ‘knowing’ what it’s supposed to be! 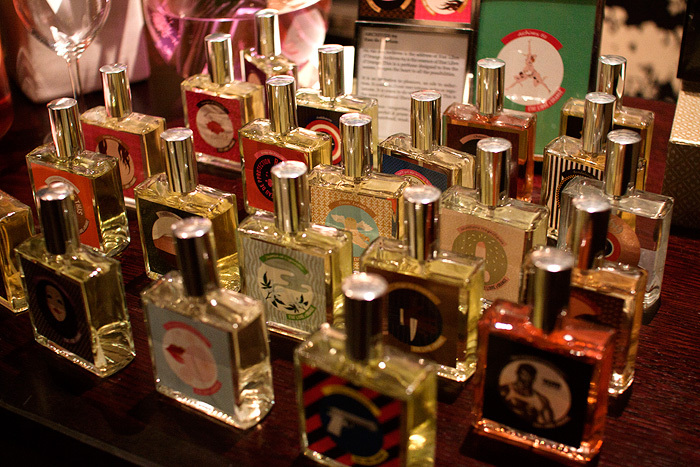 Charlotte, I came to your blog via a very serious ‘perfumista’ habit. I have a ludicrous stash of sample vials of all kinds, from the niche to the mainstream, so if you’d like to embark on a sniffathon, email me and I’ll send you a bunch ‘o’ stuff. I also have a sample of Secretions Magnifiques. If anyone wants it, just let me know. I sniffed it, and once was enough. Secretions Magnifiques was disappointing….I didn’t smell anything really offensive! Just a metallic and then slightly sour floral. Very overhyped. I am not so bowled over by the Etat Libre d’Orange range as I’d hoped. I don’t think the risque images match the nature of their products. In my opinion, their corporate identity is misleading, so disappointed!